This delighful little aquarium graces any room and is also really easy to maintain with our full range of EcoStyle 32 aquarium spares from Aqua One. We have carbon cartridges, heaters, thermometers and a full range of decor amongst many other lines. to keep your fish happy and your aquarium looking great. 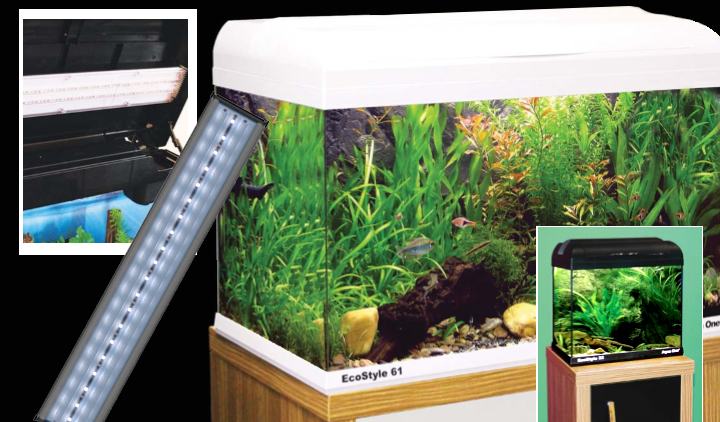 The new and very popular EcoStyle 37 aquarium is a great home for your fish. Keep them happy with a full range of genuine Aqua One spares, delivered straight to your door. Need a replacement LED lighting unit, carbon cartridges or a heater. You'll find we have everything you need to maintain your tank in perfect condition. The 28L EcoStyle 42 aquarium makes a great home for coldwater, tropical or marine fish with a lovely 7w LED lighting sleeve, ample filtration and great construction. Keep your EcoStyle in perfect condition with a full range of spares and accessories from Aqua One and Aquarium Parts. Choose your aquarium spares and supplies from our complete range for EcoStyle 47 aquarium, with a full range of heating, lighting, filtration, aquarium decor, test kits all in stock, ready to ship direct from our warehouse to your door. No one cares more about your EcoStyle aquarium than Aqua One and Aquarium Parts. Find just the right component or spare part for your EcoStyle 61 aquarium. Need a strainer? You got it! A new heater perhaps, replacment lighting sleeve, a new glass cover or filter pump? We stock every available spare part for every Aqua One aquarium, with rapid despatch and great customer service. Find a whole range of aquarium accessories including filter pumps, impellers, heaters, lighting strips an more for the new EcoStyle 81 aquarium range, here at Aquarium Parts. We are Europe's largest stockist of genuine Aqua One aquarium spares, delivered right to your door. Here at Aquarium Parts, we stock the complete range of aquarium spare parts and accessories for all EcoStyle tank models, including heating, lighting and of course trickle filtration system spares, such as Carbon Cartridges, Sponges, Filter Pumps and Impellers, along with additional items such as Intake Strainers, Outlets and more. All our spares are Genuine Aqua One branded replacements, guaranteeing optimum performance in your EcoStyle aquarium. Do have a look out for our matching range of Inspire Cabinets for EcoStyle, available in Walnut / White or Oak / Black. Enjoy the brand new, high output, low energy LED Light Strips for AquaOne's new EcoStyle aquarium. The entire EcoStyle range takes advantage of the very latest LED technology to bring you brighter, hassle free lighting at a very low cost. The future of aquarium lighting is here. Aqua One's new EcoStyle Series aquariums are largely based on Aqua One's very successful AquaStyle Series tanks and range from the 20 litre EcoStyle 32 right up to the 127 litre EcoStyle 61. All tanks in this series come complete with Wet & Dry trickle filtration systems, the latest in LED lighting technology and of course, Aqua One's comprehensive 12 month warranty. The EcoStyle 37 is an ideal tank for the beginner or where a smaller, lifestyle aquarium is desired, with the larger tanks suiting more advanced or ambitious fishkeepers. With a beautiful range of matching Inspire Cabinets available to suit every model in the range, it's hard not to recommend EcoStyle to all. Genuine and Original Aqua One Carbon Cartridge for use with EcoStyle 42 and EcoStyle 47 aquarium. (2 per pack) Change every 4-6 weeks. 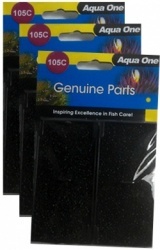 Genuine and Original Aqua One Carbon Cartridge for use with EcoStyle 81 aquarium. (2 per pack) Change every 4-6 weeks. Purifies & clarifies aquarium water and removes finer particles of fish waste and debris from the aquarium. Genuine and Original Aqua One Carbon Cartridge TRIPLE PACK for use with EcoStyle 42 and EcoStyle 47 aquarium. (2 per pack) Change every 4-6 weeks.